Sometimes you read a recipe and say "Man this sound so good I have to make this". Well that is exactly what we said when we saw this recipe in the latest version of Food Network Magazine. Steak, Bacon and Whiskey what could possibly go wrong. Unfortunately some things are too good to be true and in the cooking world sometimes things just do not turn out as well as you thought they would. This recipe was one of those things that just didn't turn out as well. You may be asking i"f it didn't turn out good why would we post the recipe?" Part of the reason we started this blog was to help people find recipes worth making and also recipes are not. Who knows you may be able to make some changes that will fix whatever went wrong. Make the steak: Mix the cocoa powder, both paprikas, brown sugar, cayenne and 2 teaspoons salt; rub on the steak and bring to room temperature, 30 minutes. Make the gravy: Cook the bacon in a large skillet over medium heat, stirring, until crisp, about 5 minutes. Remove to paper towels with a slotted spoon; set aside. Add the leek to the drippings and cook until soft, about 3 minutes. Add the flour and cook, stirring, 1 minute. Remove the skillet from the heat. Add the whiskey, then return to medium heat; if the alcohol ignites, let the flames die out. Bring to a simmer and cook, stirring occasionally, until slightly thickened, about 2 minutes. Add the chicken broth and bay leaves. Bring to a boil over medium-high heat and cook until the mixture is reduced by one-quarter, about 8 minutes. Whisk in the heavy cream and simmer, stirring occasionally, until the gravy coats a spoon, about 7 minutes. Stir in the butter, reserved bacon and parsley; season with salt and pepper. Keep warm. Heat a large cast-iron skillet over high heat, about 3 minutes. Add 1 tablespoon butter; when it melts, add the steak and sear until a dark crust forms, about 8 minutes per side. Transfer to a cutting board and let rest 5 minutes. Season with salt. Slice and serve with the gravy. Let us start by saying we did not follow the recipe to the letter. Instead of using a cast iron skillet, we used the grill. We point this out because it may have lead to the ineffectiveness of the recipe. We did however get some nice grill marks! Ok so what happened, well the steak just tasted like a steak. It was not bad, but it didn't taste like anything. We didn't get any cocoa flavor, no smoked paprika or anything else in the dry rub. We are willing to bet a lot of this was due to using the grill instead of the skillet. A skillet would have helped keep all the spices on the steak while the crust formed. On the grill, it is likely that once the juices started running off the steak so did the spice rub. As a result say goodbye to all of our flavor. These are the things that happen sometimes, and we would be lying if we didn't think this outcome was because we put it on the grill. We had our fingers crossed it would work, but we made a mistake. Had we cooked it properly we are still not sure how good this would have been and we do not plan to find out. While the steak did not come out right, the gravy on the other hand was very good, after a few fixes. We had some issues with the gravy. The flavors and ingredients all worked extremely well in the gravy, the issue came in with the cooking time and method. After the heavy cream is added into the mixture the recipe says to reduce the heat to a simmer for about 7 minutes until the gravy coats a spoon. Well after cooking this for over 15 minutes it had reduced but not thickened and the steaks were done. As you can see above we put it on the steaks and ate, but it was more of a broth than a gravy. After we ate, we were happy with the gravy. It had such good flavor we knew we had to fix it and use it for something else. So we decided to crank up the heat and reduce it as much as we could. Guess what? it did reduce to where it should have originally, it just needed to be cooked on higher heat. Now with an actual gravy we were able to fully appreciate it. We ended up using it on top of toast and a poached egg as a eggs benedict. Even though the steak came out a loser in the recipe, we did find the gravy making the effort worth it. The biggest problem with Bananas is everybody either eats them all right away or they forget they have them and they go bad. Well this past week we would ourselves in the later category. We had big dreams of eating a banana a day and so on, but Thursday rolled around and we had a whole bunch of yellow and black bananas. At this point we only had a two options, we could toss them or make the standard Banana Bread. While we don't have anything against Banana Bread, we just were not in the mood to make it. Instead we decided to look on the internet and see what other things we could do with the bananas. After a few minutes combing through multiple banana bread recipes we saw a recipe for Banana Cookies. It was posted on a food blog called Vanilla Garlic. The name of the blog threw us for a second, but we looked anyway and saw this recipe comes from the bloggers grandmothers secret recipe stash. Once we saw it was a grandma recipe we knew that this was the one to try. I mean why would grandma steer you wrong, especially when it comes to cookies? Preheat the oven to 350F. Cream the butter and sugar until light and fluffy. Add the egg and continue to beat until well mixed. Mix the mashed bananas and baking soda in a bowl and let sit for 2 minutes to froth a bit, this will give the cookies their rise. Mix the banana mixture into the butter mixture. Combine the flour, salt, and spices and mix into the butter and banana mixture until just combined. Fold in the pecans. Drop into dollops onto a parchment paper lined baking sheet. Bake for 11-13 minutes or until nicely golden brown. Let cool on wire racks. This was a very simple recipe, with a lot of ingredients that every kitchen should already have. The ease of this recipe is important because it's not often that you plan to have bad bananas in the house. The cookies had great flavor and tasted very much like banana bread. Considering the ingredients are very similar it was bound to taste the same. We put toasted pecans into our cookies and suggest that everyone add nuts into theirs. The cookies were softer than I had expected, more cake like than cookie. We found that after a few days these cookie hardened a bit and had a nice crunch to them. They went perfectly with a cold glass of milk. 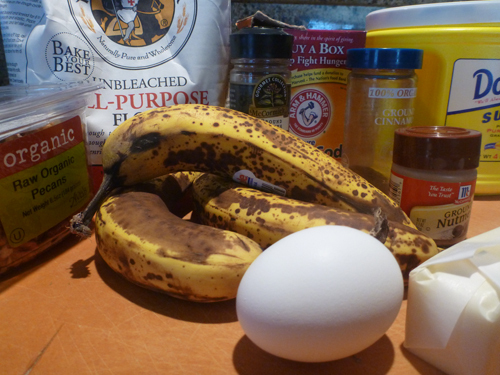 If you have old bananas and you want to try making something other than Banana Bread give these cookie a shot. Easy, quick and tasty just like a grandmother would make. Thank you to Vanilla Garlic for posting this recipe. This recipe highlights our new favorite condiment, the pickled red onion. Red onions have a certain spice which msakes them perfect on burgers, tacos or in salsa. This recipe provides an easy way to really give these onions another depth of flavor by pickling them in lime juice. Along with immense flavor, the pickling also helps give these onions a crazy highlighter pink color. We guarantee that everyone will be asking how to make these onions once they try them. They are especially good in tacos!. As we stated, we love these onions. They come out with this amazingly sweet flavor thanks to the limes. We have been putting these guys on everything we can think of. They were perfect on tacos especially the Salsa Verde Carnitas Tacos we made a few weeks ago. They were a perfect topping on both burgers and turkey burgers we have eaten recently. They also went nicely on our Mango Arugula Salad. You will see that they are very versatile and so good you will want to put them on everything. Everyone lovesa hot, freshly cooked bagels. The only problem is that usually to get one you need to be up early in the morning. If you do manage to get one right out of the oven count yourself lucky because that is when a bagel at it's peak. It is crispy and crunchy on the outside, perfectly soft and doughy on the inside. We wish we could get bagels like this everyday. While we do not plan to get up at 3 am every morning to make batches of bagels, we did want to see how to go about making bagels. We present to you our attempt at Bagels. Add all the dry ingredients to the bowl of a food processor or mixer until well incorporated, about 5 seconds. With processor/mixer running, slowly add the water; process until dough comes together and rides up over the blade, about 30 seconds. Continue processing until dough becomes satiny and elastic, about 30 seconds more. Transfer dough to a large, lightly oiled bowl and cover tightly with plastic wrap. Let rise until doubled in bulk, about 1 hour. After dough has risen but before you divide and shape it, prepare your water bath: Add the malt syrup to 6 quarts of water over high heat and let it come to a boil as you continue with the following steps. Also: Preheat the oven to 400°F. After dough has doubled in bulk, turn it out onto a lightly floured work surface and press down with your fingers to expel the gases. Divide dough into 10 equal portions. Ball a portion of dough, then roll it into a "rope" about 7 inches long and about 1 inch thick. Wrap the dough around the back of your hand, overlapping the ends in your palm. Place your hand, along with the dough, palm-down on the work surface and roll dough back and forth until ends crimp and seal together. Place dough ring under a span of plastic wrap while you repeat rope-and-loop process with remaining dough portions. At this point, your malt syrup–water should be boiling. Use a skimmer or slotted spoon to carefully add bagels, one at a time, to the water. (Note: no more in the pot than 3 at a time.) Bagels should sink but then rise again after a few seconds. Simmer for 1 minute, flipping bagels at the 30-second mark. Remove bagels from water with skimmer or slotted spoon to a clean kitchen towel. The baking sheet will collect excess dry toppings (such as sesame or poppy seeds). Simply pour them back into their containers for reuse. Place bagels on prepared baking sheet. Bake until light brown and shiny, 15 to 20 minutes. Flip, and bake until reverse side is golden-brown and shiny, about 10 minutes more. Take the ball and roll it out into a "rope"
As you can see the bagels came out looking like bagels, which is always a good sign. They had good coloring, but could have staying in few more minutes for darker browning. When we cut into the bagels, they were perfectly cooked all the way through. They had the same consistency that you would get from any bagel store. Up until this point we thought we had a major victory on our hands. The problem came when we took our first bite. Unfortunately this dough had no flavor to it. This recipe is lacking either salt or sugar in the dough, which resulted in a flavorless bagel. A bagel should have some flavor even without butter or cream cheese. We were a bit disappointed with the lack of flavor but everything else was right. Since the rest of the recipe works, it will only require some tweaking. Once we topped these guys with some butter and cream cheese all was forgiven. This recipe provides a nice base for making bagels. With some extra salt and or sugar in the dough mixture these bagels should come out just right. We have been posting a ton of recipes lately, but they have been pretty meat centric. To help appease our vegetarian/healthier friends we found a great salad recipe to share. This one is a mango, avocado and arugula salad. It is a very simple salad to put together with a nice fresh vinaigrette. Combine all the ingredients for the salad dressing in a bowl or jar, stir or shake until the ingredients are well mixed. Soak the onion slices in warm water with a dash of salt and 1 tbs lime juice for about 10 minutes. Rinse and drain the onions slices. Toss the arugula leaves with half of the vinaigrette. Add the avocado slices, mango slices and onion slices to the arugula mix, drizzle the remaining vinaigrette on top. We are not big salad eaters here at We Ate That, but we decided we have to give all things a try. We chose this salad because it had mango and avocado in it, both things we love. We had our fingers crosses that this would be at least tolerable. Once we ate, we all agreed that this salad was very good. The key to any good salad is the freshness of the ingredients. This recipe is simply arugula, mango and avocado topped with red onion slices. The vinaigrette helps to complete this dishadding a nice citrus flavor which pairs perfectly with the mango and avocado. The sweetness of the vinaigrette and mango help to cut the bitterness of the arugula. It is a very fresh salad that would work very nicely at a summer BBQ. It would also be a great complement to tacos, chicken or steak marinated with similar flavors. We would recommend this recipe to everyone, even those who do not like salad. Even though the majority of us here at We Ate That are New York Jets fans we would like to show our respect of the Super Bowl Champion New York Giants by naming this recipe "Big Blue" Blueberry Hot Sauce. This recipe is a result of the local grocery store having some great looking blueberries. We tried to think of a unique way to use them and decide Blueberry Hot Sauce could be very interesting as none of us have ever had this let alone heard of it. So we found a recipe online and decided to modify it a little bit and this is what we came up with. Place jalapenos into a sauce pan with oil. Sauté for 5 minutes and then add blueberries. Makes sure to coat berries in the oil, then add in the lemon juice and apple cider vinegar. Allow mixture to simmer for 10 minutes to allow the blueberries to breakdown. Take mixture and place into a food processor or blender. Blend mixture until smooth. Mix in sugar, and taste sauce is not sweet enough add in more sugar to taste. If your mixture is too thick, add in water to help thin the sauce. You may now jar the sauce and allow it to age as is or you can strain out the pulp. As you can see above our sauce ended up thicker than we had wanted to we added in more water to give us a thinner sauce. 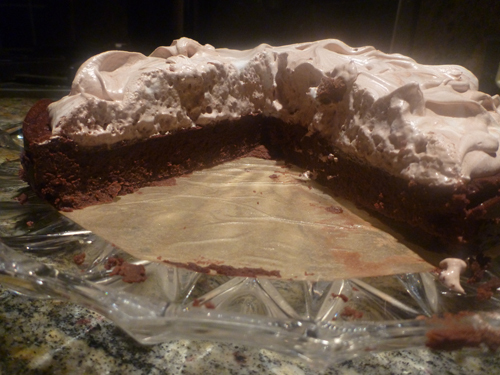 We have never made this recipe and we were pleasantly surprised with how it came out. It packed a lot of heat but was nicely offset buy the sweetness of the berries. This sauce works nicely with chicken as we tried it on some frozen chicken nuggets. It should pair nicely with chicken wings. It is not your average hot sauce, but should have people talking. Agave is a natural sweetener that is often used as a supplement for sugar or honey. It is said to be 1.4 to 1.6 times sweeter than sugar. It is made from the stalks of the Blue Agave Americana plants found in South Africa and Mexico. It is easily dissolved in liquids making it a easy product to use in your cooking. We love pork here at We Ate That, we also love Tacos. They go together so perfectly, so we decided to make some Salsa Verde Carnitas. Carnitas are the version of pulled pork made in Mexico. It is often served in taco form. You may remember that we posted a recipe for Salsa Verde before. We used the homemade salsa verde to ensure a fresh taste as compared to jarred or canned versions. Trim the excess fat from the pork shoulder roast. Place the roast, the salsa verde, onion, chicken stock, cumin seeds, coriander seeds, and oregano in a large, thick-bottomed pot, and heat on high heat. Bring to a boil, and reduce heat to a low simmer. Cover and simmer until meat pulls away easily with a fork, about 3 hours. Preheat oven to 400°F. Remove meat from liquid in pot and put the meat into a roasting pan. With 2 forks, tear the meat into large shreds, spreading them out in an even layer in the roasting pan. Roast meat for 15 to 20 minutes until parts are brown and crispy. While the meat is roasting, skim and discard fat from the liquid in the large pot. Heat the pot on high and vigorously boil the remaining liquid, stirring, until reduced to 2 1/2 cups, 8 to 10 minutes. Return the meat to the pot with the liquid. Stir in chopped cilantro. Season with salt. Serve with heated and softened corn tortillas (20 seconds each in the microwave spread out over a paper towel will heat and softened packaged tortillas sufficiently), diced avocado, crumbed Cotija or grated Monterey jack cheese, sour cream (or crema fresca). Step #7 - After roasting in the over, the pork is added back into the pot it was cooked in coating the pork in the Salsa Verde and other ingredients helping to give the pork a nice sauce. The Carnitas (or pork) came out perfectly. They were nice and tender and had great flavor thanks to slow cooking in the pot with all of the other ingredients. Roasting the pork in the oven also added a nice crisp to the pork which helps give the tacos a crunchy texture. The salsa verde was great when we made it as a dipping sauce and is a perfect addition as a sauce for the carnitas. There was a strong cumin flavor in these tacos, when making these in the future we would use a little bit less cumin to suit our taste. This is a very good recipe and is easy to make, it takes awhile to cook but does not need constant attention. It is the type of recipe that once everything is in the pot you can just walk away and take care of other things while the pork slow cooks. Going into Super Bowl weekend we would be remised if we did not provide everyone with a wing recipe for all of those Super Bowl Parties going down. We wanted to changed it up from the regular "hot" wing recipes and we found a simple Maple Chipotle Wing Recipe. Coat a large baking sheet vegetable oil. You can also line the sheet with foil. In a bowl, mix the flour with the salt and sage. Add the chicken and toss to coat. Spread the chicken on the baking sheet in a single layer and spray with vegetable oil. Roast the chicken for 45 minutes, turning once or twice, until browned and crispy. In a bowl, whisk the hot sauce, butter, chipotle pepper and maple syrup until combined. Add the chicken wings to the sauce and toss. Above is the wings coated in flour, sage and salt about to go into the oven. Here is the hot sauce starting with butter, Frank's Red Hot, Chipotle Pepper and Maple Syrup. We had high hopes for this recipe, but we did not expect it to be this good! These wings came out extra crispy which is amazing since they did not touch a deep fryer. They were seasoned perfectly thanks to the flour mixture. The Maple Chipotle Sauce had the perfect balance of sweetness and hot sauce flavor. We were worried that these wings would be too sweet, but they were perfect. They tend to be on the mild side in terms of heat. If you prefer your wings to be on the hotter side, you may want to add 1 or 2 more whole chipotle peppers into the hot sauce. This will add more heat into the sauce and also give you more chucks of peppers on the wings. Anyone looking to make wings for the big game should consider making this recipe. These are not your regular old wings, you get a nice hint of sweetness followed by the familiar smokey flavor of regular hot wings. Baking them in the oven also helps make them a tad bit healthier than the deep fried variety. Get after these wings and lets us know what you think! We are trying our hand at making Salsa Verde. Salsa Verde is a versatile dish because it can be used in numerous ways It is often used as a condiment, a dip or even part of a stock in other recipes (we used some of this in one of our upcoming recipes). The main ingredient in Salsa Verde is the tomatillo. Tomatillos are in the nightshade family and are closely related to the cape gooseberry. Like the gooseberry, tomatillos come "wrapped" in a papery husk and once ripe must be removed prior to being eaten. Remove the husks from around the tomatillos and rinse well. Cut the tomatillos in half and place cut side down on a baking sheet along with the onion. Place under a broiler for about 5-7 minutes to char the skin of the tomatillos. Place tomatillos, lime juice, onions, cilantro, chili peppers, sugar in a food processor (or blender) and pulse until all ingredients are finely chopped and mixed. Season to taste with salt. Cool in refrigerator. We were pretty happy with the Salsa Verde. It is very mild and perfect for anyone who does not like "heat" in their food. For us it was lacking the heat we prefer, but that can be fixed. In the future we plan to leave the seeds in our peppers to help give it the heat we desire. This salsa is perfect as a topping for your tacos or just serve as a dip for tortilla chips. For today's recipe we have a few different components. We have made pizza dough, sauce, and chicken cutlets from scratch. We will focus on the creation of the pizza but will provide the recipes for the other components also. You can use store bought ingredients but where is the fun in that. In a bowl, dissolve yeast in warm water. Let stand until foaming, about 10 minutes. In a large bowl, combine 2 cups bread flour, olive oil, salt, white sugar and the yeast mixture; stir well to combine. Keep mixing until a stiff dough has formed. Cover and place in the fridge to let rise until doubled in volume, about 30 minutes it can also be left overnight. When ready for the dough, punch the dough down to take some air out. Turn dough out onto a well floured surface. Knead dough into a round ball and the shape the dough to the desired crust shape. * If using the dough on the same day, start creating your sauce while the dough is rising. Heat olive oil in a saucepan, then add the minced garlic. Cook until slightly golden for about 2 min. Then add the onions into the garlic. Let the onions and garlic cook down until soft, add pepper and salt to taste. Remove tomatoes from the can and hand crush them into the saucepan. Make sure to add any remaining liquid from the can into the sauce. Add the basil into the sauce as well as salt, pepper and red pepper flakes to taste. Bring sauce to a boil. Once the sauce reaches a boil lower the temperature to a simmer and allow sauce to cook down to your desired thickness. You may be asking why I specifically said San Marzano tomatoes. This is because I personally feel the offer superior taste compared to all other tomatoes. They are so good you could easily eat them out of the can so they do not need much to make a great sauce. The flavor of these tomatoes t is said to come from the volcanic soil the tomatoes grow in. To learn more about San Marzano Tomatoes Click Here. Spread the sauce around your dough using a ladle. Start from the center and work your way outward. Take the cheese and cover the pizza, ensuring there is enough cheese to cover the basil so it does not burn. Slice chicken cutlets into strips and place on the pizza. Then cover each strip with a small amount of sauce to help keep the chicken form drying out in the oven. Drizzle olive oil across the top of the pizza. If you have a Pizza stone feel free to place the pizza right onto the stone. If you are using a tray place a small amount of corn meal on the pan to help keep the dough from sticking to the pan. Cook pizza for about 8 - 12 minutes or until golden brown. Be sure to check your pizza often as all ovens vary. As you can see there are more than one pizza pictured above, they all turned out perfectly. The chicken pizza specifically came out great. The cheese and sauce we both fresh which adds a fresh flavor to the pizza. The dough itself was crispy and a bit too think. Next time we would make sure to work the dough a bit more to get the extra air out of the dough. Overall we were very happy with the results of this recipe and would definitely recommend anyone that enjoys pizza to try making it at home. It is not nearly as hard as it looks, just takes some practice. 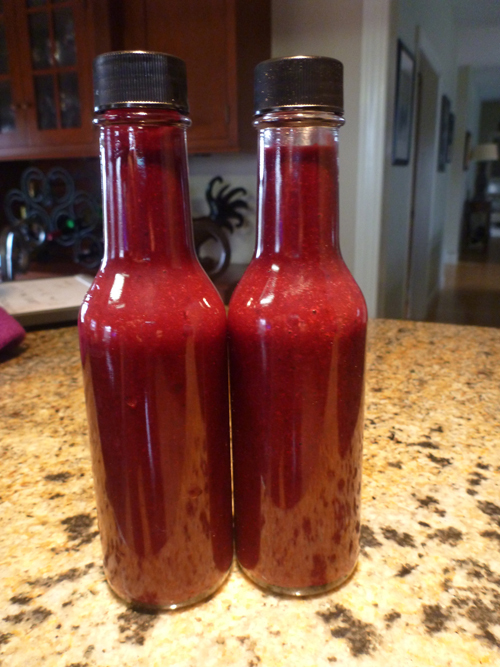 For our first recipe on the site we have decided to go with our foray into hot sauce. We chose a Mango Habanero Hot Sauce with the intentions of making our own version of the Buffalo Wild Wings Classic Mango Habanero Wings. This recipe is a tribute to a friend who loves Buffalo Wild Wings and more specifically the Mango Habanero Boneless Wings. We even heard a tale of a road trip in which he stopped at 5 different Buffalo Wild Wings in one day (eating in at least 2 of them). After sifting through numerous recipes online, we finally found one that looked up to our standards. In stock pot add Habaneros, water and salt. Slow boil for 15 minuets. then drain, saving 3/4 cup of water. Puree in blender the saved water and all ingredients except vinegar. Return to stock pot and simmer on medium low heat for 10 minutes, stirring constantly. Remove from heat and stir in vinegar till slightly cooled. Keeps in refrigerator 4 months or can and process. Refrigerate after opening. Serving Ideas: Sweetly Hot and Spicy ideal for chicken, pork or fish. After following the directions step by step, here is the finished product. The sauce has some great flavor, it starts off with an intense mango flavor with very little heat. The heat then slowly starts to make itself known and after a few seconds you start to feel the full effect of the Habaneros. While you can feel the heat it is not overpowering and adds some nice depth to counteract the sweetness. We have not been able to test this sauce on wings yet because it does still have to age. With most hot sauces it is recommended that you let it age a minimum of 2 weeks to really let all of the flavors and heat of the sauce develop. The plan is to make some wings for the Super Bowl and give this sauce a wing test. - When working with hot peppers you may want to wear gloves. When cutting, stemming and seeding peppers you will be exposed to Capsaicin. This is the active chemical in peppers that produces "heat" and if you do not wash your hands properly you may inadvertently get some capsaicin in your eyes. It is not pretty. - After you have aged your hot sauce you have the option to "strain" the sauce. Doing this will allow you to remove any pulp and or seeds which will create a smoother/thinner sauce. This is optional as some people do prefer to have a thicker sauce.